"Like a giant Reese's Peanut Butter Cup!" Coworkers RAVED about this recipe, and for good reason: who doesn't love the decadent pairing of chocolate and peanut butter? An even bigger surprise? The secret ingredient was...tofu (coworkers were in disbelief)! This absolutely amazing pie was the first-place winner of the 2005 Vegetarian Times Reader Recipe Contest. And I LOVED that it was so easy to make. Just pop all the ingredients into a blender (or food processor), pour into a prepared crust, and refrigerate. (Well I have to admit, the blender got stuck once I added the peanut butter, so I ended up mixing most of it by hand.) I was afraid that the semisweet chocolate chips that the recipe called for wouldn't make the pie sweet enough, but I was wrong. Maple syrup was added for sweetness, but the amount was just right. 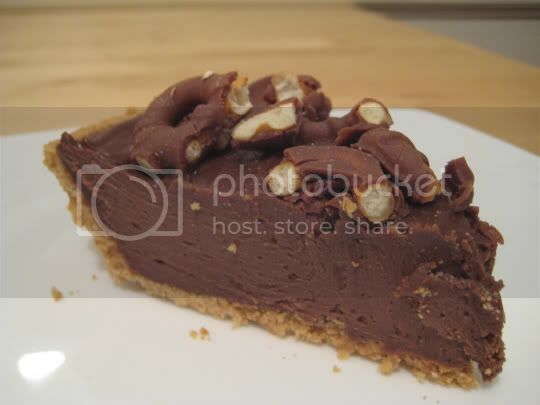 This pie was so thick, rich, and creamy, and the chopped up chocolate-covered pretzels added a just a hint of saltiness and a nice crunch. The recipe suggests to chill the pie for 20 minutes before serving, but I think this did much better (as far as texture and ease of slicing) refrigerated overnight. One hint: the pretzels will soften if you sprinkle them on top of the pie and store overnight.